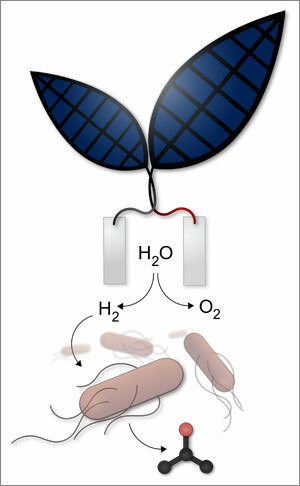 (BOSTON) — Harvesting sunlight is a trick plants mastered more than a billion years ago, using solar energy to feed themselves from the air and water around them in the process we know as photosynthesis. In their new system, once the artificial leaf produces oxygen and hydrogen, the hydrogen is fed to a bacterium called Ralstonia eutropha. An enzyme takes the hydrogen back to protons and electrons, then combines them with carbon dioxide to replicate-making more cells. This work was supported by Air Force Office of Scientific Research Grant FA9550-09-1-0689, Office of Naval Research Multidisciplinary University Research Initiative Award N00014-11-1-0725 and a National Science Foundation Graduate Research Fellowship. The Wyss Institute for Biologically Inspired Engineering at Harvard University(http://wyss.harvard.edu) uses Nature’s design principles to develop bioinspired materials and devices that will transform medicine and create a more sustainable world. Working as an alliance among all of Harvard’s Schools of Medicine, Engineering, and Arts & Sciences and in partnership with Beth Israel Deaconess Medical Center, Brigham and Women’s Hospital, Boston Children’s Hospital, Dana-Farber Cancer Institute, Massachusetts General Hospital, the University of Massachusetts Medical School, Spaulding Rehabilitation Hospital, Boston University, Tufts University, and Charité – Universitätsmedizin Berlin, University of Zurich and Massachusetts Institute of Technology, the Wyss Institute crosses disciplinary and institutional barriers to engage in high-risk research that leads to transformative technological breakthroughs. By emulating Nature’s principles for self-organizing and self-regulating, Wyss researchers are developing innovative new engineering solutions for healthcare, energy, architecture, robotics, and manufacturing. These technologies are translated into commercial products and therapies through collaborations with clinical investigators, corporate alliances, and new start-ups. Harvard University Faculty Arts and Sciences (FAS), founded in 1890, is the largest division of Harvard University. The Faculty of Arts and Sciences is dedicated to being at the forefront of teaching and learning and fostering cutting edge research and discovery. FAS is redefining liberal arts education for the 21st century and is committed to an open Harvard and student aid by making a Harvard education accessible to students from all backgrounds. FAS comprises Harvard College and the Graduate School of Arts and Sciences, including undergraduate and graduate admissions; the School of Engineering and Applied Sciences; and the Division of Continuing Education, including the Extension and Summer Schools. FAS also encompasses academic resources, such as libraries and museums, as well as campus resources and athletics.